Colbert Hills is the ideal place for groups to hit the links. As the ultimate destination for golf in the Flint Hills, we are the perfect place for guests of all experience and handicap levels. Colbert Hills has the amenities and banquet space necessary to make your golf outing or tournament a successful and memorable experience. Food & Beverage: With our on-site restaurant, Colbert's, we have the capabilty to meet your food and beverage needs surrounding your golf event. Let us work with you in providing a full service experience! Sponsor Signage: Let us take care of your sponsor signage. Hassle free and at a fraction of the cost. All we need is what you want on your signs; we build them and put them on the course prior to your event. ​Tournament Gifts: Colbert Hills has many different things to choose from inside our pro shop. Let us help you with your tournament gift, you give us a price range and we will get you some ideas of what your players might like to receive for playing in your tourney. 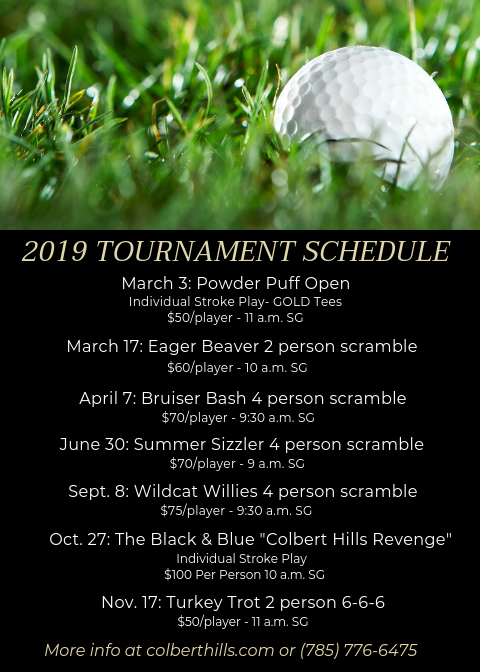 Prizes: Colbert Hills offers Gift Cards along with a wide selection of pro shop merchandise to choose from for prizes. We can also help with trophies or plaques for your winners.